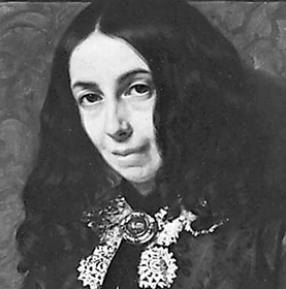 It's National Poetry Month, and we're celebrating by featuring the work of a wide variety of poets, including Elizabeth Barrett Browning! Browning was born in 1806 in Durham, England. Her family were wealthy sugar plantation owners who, though originally from England, had lived in Jamaica for generations. Browning was educated at home, and was something of a literary prodigy, devouring works by Shakespeare and other great writers before she'd even turned ten! By twelve she was already writing poetry and expanding on her studies. A devout Christian, she taught herself Hebrew in her teens so she could study the Old Testament. At twenty, Browning released her first collection of poetry, an anonymously published volume titled An Essay on Mind and Other Poems. Her family's fortunes took a turn for the worse when the plantations, suffering from the abolition of slavery and the long-distance management of Browning's father, began to fail. They moved to England's coast, and then took a house in London. Browning continued to write and study. In 1833, she published a translation of Aeschylus' Prometheus Bound before turning her attention back to poetry. Suffering from ill health, Browning planned to spend a year on the coast at Torquay with her brother Edward, but he drowned in a sailing accident and Browning returned to her overbearing father's household, heartbroken and an invalid. She spent five years recovering, during which time she published Poems, the 1844 collection that first brought her to the attention of Robert Browning. Two years later, after a whirlwind romance-by-letter, the couple eloped despite Elizabeth's father's objections and took up residence in Italy. Browning broke with her father completely and never spoke with him again. Browning's later work encompass both her Christian faith and her political ideals. Despite the fact that it dampened her popularity somewhat, she was a staunch abolitionist and an advocate for the protection of children from harsh working conditions. She continued to write until her death in 1861, and her work was well recognized throughout Europe during her lifetime.